He smiles as he remembers the feelings of inspiration and excitement that overtook him that morning, “I was hype and decided I was gonna write my own song.’” He then poured his heart into “Impressions,” what would soon become his first single. If it wasn’t for that quiet morning in Switzerland, Del Valle would still just be thinking about becoming a superstar instead of writing songs, getting gigs, and sharing his work. He was sick of wanting to be an artist, wanting to be famous, wanting to make music. “I was doing nothing to head that way,” Del Valle says. He had trouble committing so much time and effort into anything, but that morning taught him “that good things come out of putting your full effort toward a task.” Del Valle opened a door for himself and became serious about music. When Del Valle returned to Holland, he got in contact with his friend Jack Miller to produce his single. In a small Hope College dorm room, Del Valle spent 45 minutes recording “Impressions.” He made it for a sense of self-accomplishment and “honestly didn’t expect [his single] to do anything.” The song starts out with the soft plucking of a guitar and Del Valle’s clear tenor voice. The rich presence of piano soon layers in along with the strumming of a guitar. It’s a simple, beautiful song that has already gained 268,000 streams on Spotify in the past 11 months. Del Valle has always had a fascination with music. It started when he was just a kid, “listening to the High School Musical and Grease soundtracks.” He wound up singing those songs around the house with his sisters and falling in love with music. Del Valle joined choir and, realizing that he had a passion for singing, continued to sing throughout high school. But Del Valle didn’t stop there; he knew that if he wanted to pursue music he had to put in the work. So, he took voice lessons to further improve his vocals and taught himself how to play the guitar. Music quickly became more than just a hobby: “I played around with guitar ever since I was 12, but a year ago I started playing more seriously,” Del Valle said. In 2017, Del Valle got his start as a performer with The Westside. Elijah Kliphuis was looking for some musicians to perform alongside him at the high school’s music festival, WO Stock. “I was good buddies with Elijah Kliphuis and he was like ‘let’s start a band,’” explains Del Valle, who replied excitedly with, “Heck yeah, let’s start a band!’” The Westside performed at a number of local venues, open mic nights, and school events; they even dropped their first album, Clouds. Learning a lot and growing as a musician along the way, Del Valle wrote a few songs and did vocals. A lot has happened since then. Del Valle has bloomed into an independent writer, performer, and artist. Reluctant to sound cliched, Del Valle notes that he is inspired by singer-songwriters like Ed Sheeran who are able to describe their feelings through song, because that has always been something he has wanted to do. “And now I can do that,” he says in humble realization. Del Valle used to feel as if “there was this big, huge barrier; you have to write a song like this, you have to do this to be successful, if you want to make money you have to do this.” But he has recently realized that there’s no formula for the pursuit of success or songwriting, “Don’t feel like it should sound like something else,” he says. Within the past two years, writing has become Del Valle’s passion. He writes songs to convey his personal feelings or experiences. Sometimes, he’ll listen to other people’s recounts of heartbreak, happiness or struggles to “get an account for their stories and try to write the song for them.” Writing is an outlet for his emotions and creativity, not something he can sit down and force himself to do: “I have to really feel it to write,” he emphasizes. Del Valle writes and performs to reach out to others: “I want to create an experience that people can relate to, not just something to listen to–” He pauses to retrace, clarifying that everyone’s welcome to listen for fun, “–but I just want something for them to connect to and enjoy at the same time,” says Del Valle in a genuine tone. With a passion for sharing and creating music, Del Valle has been working hard with White Elephant Records to release his first original album. How Del Valle connected with White Elephant Records seems like fate. “It was bizarre, I was just like ‘Dang I wish I had a record label or something,’” he explains, “and my friend just said, ‘Yo, I’m actually interning for a record label right now.’” Del Valle sent them demos, got in contact with the label, and was recording his music in their Big Rapids studio just three days later. What was originally supposed to be an EP has turned into a full-length album called A Fool’s Love Guide. He’s been working hard, sometimes for weeks at time, recording and perfecting his music. “I was recording a song for about three hours last Tuesday,” he explains. Self-motivation is what originally drove him to create music, but his close friends help to keep him motivated. 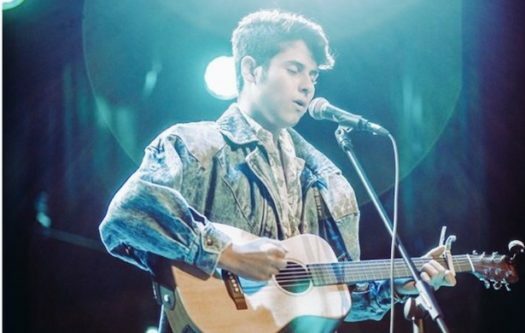 Del Valle’s success comes from the heart; he grew up with music running through his veins and has worked hard to create his own voice. “I want to be Zyon Del Valle,” he says, which not only alludes to his desire to become an independent artist, but the authenticity in his work. Del Valle has every intention of incorporating music into his future. “I really want to make a living off of writing songs, not necessarily performing them, but being a freelance songwriter or working for a big label.” He plans to attend Columbia College Chicago in the fall and double major in “either songwriting, music business, or music therapy.” His end goal is to eventually open his own record label and write songs for other people, “I think that would be so dope,” smiles Del Valle. With his ambition and passion, there’s no question that you’ll be hearing his name again.